To celebrate my author page getting updated, I’ve decided to do a free giveaway of the Kindle version of my latest book on Amazon. The offer only lasts until Sunday at Midnight, so feel free to share the link below. The Clark children didn’t have beds, but slept on straw filled ticks on the floor. When company came for dinner, it was the custom to have the children wait until the adults were through eating, or stand at the table to eat, because of the lack of chairs.Friendly Indians frequently rode about the area on their ponies. The braves would shoot squirrels with bow and arrows, and roast them over a fire on sticks. The Clark boys were invited to share this delicacy with the Indians. It sounds like the beginning of a great adventurous life, and through those experiences Lucius gained insight that allowed him to leave behind a great legacy. That legacy was passed on to his children during his lifetime, and is now passed on past that generation through this book. 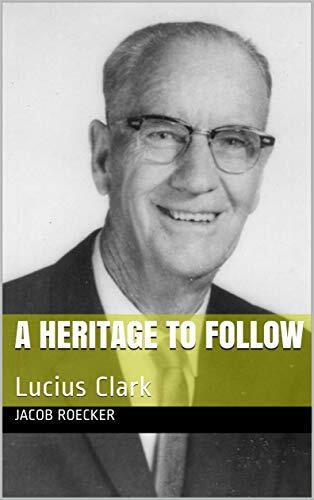 This is a selection of the writings of Lucius Clark and those who knew him. 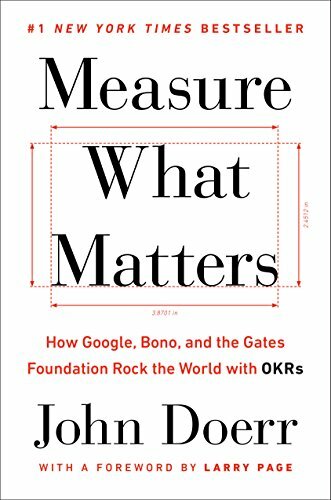 Measure What Matters by John Doerr is an excellent addition to my book list. The text articulates very clearly how to synchronize multiple levels of activity into a cohesive combination of effort. We’ve talked before about the importance of measurements. This book answers much of what’s needed in the process of getting to good measurements to get good results. This book is ideal for anyone who values context of what they are doing. It does this in two ways. It allows you to see the context in a system that may not publish it for you, and provides you to the tool set to create that context if you are in a leadership position. Measure What Matters reviews the process of Objectives and Key Results (OKRs). The book doesn’t come across as a how-to. It recounts the power behind the method and then injects anecdotal evidence from multiple diverse sources. For the audio book, many of the sources appear as guest readers including Bono. While Bill Gates’ name appears on the cover, his contribution is read by an actor, though the content is still highly illuminating. They say you’re not supposed to judge a book by its cover. This book has a reasonably plain cover, but so does Getting to Yes and forty years later it’s still a standard read. I imagine that Measure What Matters is in line to have a similar legacy. This work is licensed under a Creative Commons Attribution-ShareAlike 3.0 Unported License. It is available as an audiobook, paperback, and kindle. The air cooled and with the chill came the feeling of anticipation. Just as they had at Makuan they watched as the lights in the houses went out one by one, and began their journey toward the woods near Ashoqa. A half moon lit their way, covered at times by moving clouds floating across an ocean of blackness and speckled stars. The two companions sped as quietly as the dandelion in the breeze as they traveled across the landscape. The lioness’ paws were light and soft, and did not produce any sound. Dashtek’s feet were just as mute choosing to travel on the grass that grew in the middle of the dirt roadways. Their hunger was all but forgotten, replaced by the hope of a successful conclusion to their difficult journey. The first light of dawn appeared just after they had entered the woods. A few pockets of leaves had begun to change color, but most of the forest hadn’t shown any signs of colder weather. The woods were thick enough that they need not travel far to hide, but Dashtek knew the further in they went the more security it meant for the two of them. He lead the way deep inside until they came to a brook which ran from a nearby hill and eventually into the river. They day began to grow warm and they were exhausted. Dashtek took a small piece of rope and made a rabbit trap on a game trail nearby. Exhausted the pair lay down on the forest floor and slept through most of the day. When they awoke Dashtek had discovered the rabbit trap had worked. He offered the raw animal to the princess, who refused it. Thinking that she wanted it cooked first Dashtek built the evening’s fire and cooked it. When he offered it to the princess she still declined. Confused at the situation, Dashtek took a few bites and then offered the rest to the princess. She accepted, but only after nudging at her bag. Her demands that evening were not only did she want to make sure he got to eat first, but she also wanted a story during her portion of the meal. This time he didn’t protest and went skimming through the pages to find a story he felt he could read without too much trouble. He chose to read the story of Malik and his garden, a slightly odd tale about a man and his plants. The story was the longest Dashtek had read so far and his fumbling over the words only made it longer. Still he continued on and even finished on a reasonable recitation before the two decided to sleep. The morning began with the chill crispness of the approaching fall weather. Dashtek knew he needed to build a shelter for them quickly. The snowstorm they had survived in the mountains could be a precursor to a strong winter ahead. He had purchased a small axe in Makuan and began to use it to clear a few trees by the brook. His plan was to construct a rough log hut, filling the gaps between the logs with mud, and laying bark patched on the outside to help insulate and disguise the dwelling. Dashtek was industrious, but still the work was slow until the two discovered Princess Jan could help move the logs across the forest floor by constructing a rope harness. Dashtek would chop down a few trees and have them waiting to be moved by the time the princess would return from her duties hunting. Working together in this manner made the job much easier. They would usually move the logs into place while the latest kill would cook on the fire. Days and weeks passed before they had anything better than the outdoors to sleep in. When the first serious rain of fall came the roof was finished enough to offer much more protection than just standing outside but that’s not without admitting there were a spots that still leaked. Building something as complex as a house is a process. It doesn’t get done in one day. The princess insisted Dashtek spend his time in the driest corner, reading. After weeks of practice his reading had shown improvement with each attempt. It had taken him a few days to be able to complete the story of Malik and his garden to the princess’ liking. The request for a story after dinner became a routine that did not slacken during the weeks of construction. Now, during the first rainy day, Dashtek was able to read most of the stories to the princess’ satisfaction within two or three attempts. One afternoon Dashtek was preparing a bundle to shore up part of the roof while the princess was nearby hunting. Just as Dashtek’s reading improved with practice, so did her abilities as a hunter. She had become such a good hunter that they did not store much food in their hut. Instead they relied upon her skill to kill as needed. This way nothing would waste. On this particular afternoon a white bearded man wearing something like a Fedora came walking up the brook. He introduced himself as a village elder name Spen Geree and explained that he lived in the house closest to the woods being called to town occasionally to doctor a wound, judge a dispute, or officiate in a marriage. Dashtek gave his name and through the conversation told him of his being a squire and that the knight he served had died in his sleep granting Dashtek the freedom to travel to this land. The princess’ hunt that day was fairly close to the hut and when she heard the conversation she began creeping silently forward to listen masking her movement behind the wood pile. At Dashtek’s response Spen Geree knew to abandon the issue. He had seen enough couples in love to know through the way he spoke that Dashtek’s heart was already taken. From behind the woodpile the princess now knew this too. His words rang plain in her ears; his reason for becoming better now perfectly clear. As he parted the old man once again offered his home and food if the winter proved too harsh. It was an offer made out of courtesy, as they both knew Dashtek would likely never use it. Liz Erickson has always enjoyed using her talents to create. Those who know her will not be surprised that she took on the project of drawing the illustrations for this work. Liz worked with ease to adapt her style and provide the author with the specifically desired drawings for this book adjusting quickly from her experience in fashion and painting. It seems safe to predict that this will not be the last time Liz’s name appears as the illustrator of a printed work. She is just as much a magician with her talents as Alamus with his wand. It wasn’t a pleasant night’s sleep for either of them. Sleeping on top of someone else works only for a little while before you start to notice how terribly bony people really are. That, combined with the cold, made the whole experience rather uncomfortable. To say the pair awoke in the morning as though they’d had a good night sleep would be entirely misleading and a little too much like a fairy tale. The important thing to say here is that in the morning, both of them woke up. The pair moved from their shaded outcropping. Stepping forward they noticed sun was out and reflecting on the snow with such brilliance that it took several minutes for the companion’s eyes to adjust. Several large black rocks from that part of the mountain pass jutted out of the snow and the pair realized that the warm weather they were feeling would cause it to melt. Weather in the mountains is often unpredictable, and storms can pass as quickly as the come. They ate their jerky while they walked, their course still leading upward. By the afternoon the snow was mostly melted off the pathway. To protect her paws, the lioness traveled on what remained of the snowdrifts as much as possible. They found a rather good spot to camp that evening. Dashtek’s shoes were soaked from walking through the wet snow, and he took them off to dry by the fire. He reached into the bag to inventory their provisions and discovered they only had enough jerky for the evening’s meal. The princess let him have first pick. She had grown remarkably more kind toward him, but that’s to be expected. You normally don’t save the life of someone you don’t care for, and you normally don’t spend a night letting someone use your body heat for survival without having some sense of caring. After they had both eaten he put the bag down between them and they both warmed themselves by the fire happy to be alive and in good company. Then, the princess buried her head in her bag as if to look for something. She carried on digging about in the bag for a little while longer. When her head emerged again she had her leather bound copy of the Hallbrook gently in her teeth. She moved over to where he was sitting and dropped it on his lap, then sat on her hind legs with her tail flicking back and forth. She waited for him to open it. “Princess, I don’t think I can read this. I’ve been a squire, not a schoolboy.” He continued on, but it did not matter. She maintained her anticipating pose and regardless of his protest her eyes begged him to read. One might think that getting asked by a lioness to do anything would be motivation enough, but Dashtek didn’t see the lioness. He only saw a pair of brown eyes pleading at him. The difference here is that he was motivated by a request and not a demand. He turned a few pages looking for some portion of the book that was short. The section he selected was a brief rhyme about a bird. Dashtek could read, but having never been to school had never practiced. This meant that when he read each word came out slowly in a series of unconfidently strung together syllables. The poem about the bird, although only a few lines, took a considerably long time to read and had you been present to hear his recitation you would not have known it rhymed. Dashtek, uncertain of himself, looked up several times as he read. This meant when he returned to the book he had to find his place again making the experience quite awkward. He was embarrassed. The princess still looked on with the same eagerness she did at the beginning. The steadiness of her expression only made him more nervous, so when he got to the end he was happy to be done and quickly closed the book, and put it back in the bag. Job done! When he looked up from putting the book away, she was still sitting there, the same brown eyes asking for more. He opened the bag again, removed the book and turned to another poem. This one was shorter, but as he stumbled through they syllables of the first word he heard a low growl come from the princess. He turned the page and began a different poem from either of those before. He started with the first word. This routine occurred several more times until finally he returned again to the poem about the bird. He read it through the second time and it was only slightly less awkward than before. This time before he closed the volume he looked up at the lioness to see if she was through listening. She wasn’t. He opened the book and read it again. This time the words were considerably less cumbersome. Had you been listening this go around you would have noticed that at least two of the lines rhymed. When he finished he looked up again. The princess was now laying down, but her eyes still asked him for more. And so he read the poem again, and again, and again. As he grew better at reading the words she began to purr and finally on his last recitation she had playfully rolled over on her back, watching the stars and listening to a little poem about a bird. The exact words of the poem were not particularly romantic or particularly sad and so Dashtek wondered what her interest was in the simple poem. Did she like birds? He knew a great many things about the princess, but if she developed an affinity toward birds it was news to him. No, he did not understand until much, much later that her interest wasn’t in the words of the poem, but in the person who was reading it. In the morning they began their journey on empty stomachs. Before lunch time they had crested the mountains and noticed the journey downward was considerably shorter than the one upward. By afternoon they caught site of the North Country and below were the two towns of Popalzai and Ashoqa, the Argandahb river separating the two. The river was swollen from the melting snow and Princess Jan and Dashtek both stood watching the ribbon of water wind its way through forest and farmland then between the two towns and off again into the distance. They each took in deep breaths of air drinking in both the scents of the fertile valley and the freedom that lay ahead of them. Here they were sure no one had heard of a lion in their country and therefore no one would be hunting for one. As the pair watched, they observed the patterns of life of the farmers and villagers, noting the roads that were more defined and those pathways that were less used. Dashtek pointed to a wood near Ashoqa. He looked at her face hoping to judge by her response by the expression. What he saw was something new to him and he wasn’t able to pinpoint exactly what it meant until years later when he would repeat this story to the children who would request it at their bedtime. The rest of that day they dared not travel for fear of being seen. They agreed to go by nightfall, and spent the rest of that afternoon resting. As each of them lay down for a nap, the pangs of hunger set in. Dashtek could find nothing edible in the area but a few bitter onions. They each tasted one and resolved that it was better to just go hungry. Each of them tried once again to sleep. Some time passed while they each made their attempts to calm down and sleep. The lioness gave up more quickly than Dashtek. After waiting a few moments she turned her head to Dashtek and watched him. Dashtek, sensing he was being watched by a lion, couldn’t sleep, and though he tried to remain still she saw through the ruse and drew closer. He heard her move, but remained as still as he could. She playfully picked up the bag with the Hallbrook and dropped it with a thud on Dashtek’s head. He was vertical almost instantly and just as quickly realized that she meant it as a playful joke. He knew that was her way of saying that he should read again. Since his stomach was a large reason why he couldn’t sleep he agreed to spend the time reading thinking it would at least distract him from his empty belly. Instead of remembering yesterday’s reading experience as an accomplishment, Dashtek only remembered the awkwardness of his first few attempts. He was embarrassed by the memories of his failures and not by the success of his achievement. On the other hand she remembered his success. Once again he tried to say no, but she was ready for his protest. It did not take long for Dashtek to be reminded by her eyes that she was still the princess. This time Dashtek chose a short story called “The Dolmen.” It was about a good knight whose wife had died while he was off defending the kingdom. It was a sad tale and Dashtek’s first reading of it was cumbersome and stripped all the emotion from the story. When he finished the princess gave him the same look of persistence she had given him the night before and so he read it again, and again, and again. He continued to read it until the words seemed to flow from him. Eventually he was able to settle his mind and he imagined that he was reading it with the same tone as the author’s mind. This simple trick made it easier to read, and to listen to. In the end, though both had heard the story many times, the companions felt like crying, Dashtek because he had connected with an author’s emotions, and the princess because she had begun to understand what caring for someone else actually felt like. Speechless, they aimed their eyes toward the sunset and watched feeling equally happy for the being at the beginning of the next chapter of their story, and sad for the one they had read. To make up for the early stop the day before the companions had to put on a few more miles then they originally planned. They were not sure how many days travel it was to the North Country but they felt compelled to get through it as quickly as possible. In this case the unknown was not a wonderful adventure, but a terrible cliff of uncertainty. It’s the unknown that lead mankind to believe that the earth was flat, and it was the unknown here that occupied the companions’ thoughts. Had they factually known how long it was they could have planned for it be it a few days, a week, or a month. Knowing would have simply allowed them to adjust their plans. Not knowing how long meant they needed to push themselves without over exertion and find the right pace for appropriate food consumption. Figuring that out usually takes experienced hikers today years. The schooling of a princess and a squire didn’t train them to calculate optimal efficiency through rocky mountains. If anything slowed them down they might get snowed in and neither of them knew how’d they’d fare if an early storm got in their way. They made good time in the morning, but in the afternoon Dashtek noticed the princess would pause at times to lick the pads on her feet. By evening when they stopped he saw that her paws had become raw from walking on the all the rocks. Each step had become an experience in dealing with pain. To numb the hurt he suggested that she cool her feet in the river. He went to the bank and watched as she waded in up to her ankles. The cold mountain water helped to numb her from the pain but did not resolve the wounds. There was no way they could maintain their pace with the injury. It would certainly slow them down. They hadn’t moved far enough to make up for the early stop the day before and with this problem they couldn’t take another step further. Sure they could have, but then they would only be doing more damage. At this stage the princess was partially mobile. If they continued her feet would begin to blister and bleed. The only choice was to stop for the night. Dashtek made camp. The princess would wade into the stream every hour or so until finally it was time to sleep. As Dashtek laid down and waited for sleep to come, he recalculated their journey with this new variable in mind. They had lost nearly a full day’s travel but had eaten two days worth of food. Did they have enough to make it through? What would they eat if they ran out? He anticipated the gnawing of his stomach while he traveled. That same gnawing feeling joined him in his sleep and robbed him from the last possibility of a good night’s rest. In the morning the princess made a trip into the stream to numb her feet before the companions began to climb higher up the trail. As Dashtek feared the day’s pace was considerably slower. Dashtek’s feet, shod in his favorite shoes began to hurt as well, in part because the rocks now were more brutal than anything previously, and also out of sympathy for the princess. Once Dashtek noticed a small trickle of blood left behind on the rocks from the princess he scanned for the next spot the two could bed down and halted for the day. The princess was surprisingly silent while dealing with her pain and Dashtek would have liked to know why. It could have been that as a lioness she didn’t have the ability to speak, but even when she could speak as a princess her posture said a great deal. Her posture now was more reserved and as Dashtek noticed he realized that in the past few days Dashtek noticed she hadn’t once used her characteristic stomp, which helped him recognize her in the camp. The next day started off slow, and continued to get slower throughout the day. They had no choice but to press on as their food supply was dwindling and their hopes for catching game had disappeared. The terrain was too barren and the princess’ newly found hunting skills were neutralized by her injury and the scarcity of game. They pressed on through the day and into the early afternoon. As they continued to travel the air grew considerably cold, more than what one would expect from just the sun setting in the mountains. They took one of their many short breaks. The sweat entrapped in Dashtek’s clothes cooled quickly and after a quick shiver he pressed himself and the princess to move forward again. Moments after they resumed it began to snow large wet flakes. Soon the flakes began to stick to the ground. As the snow began to thicken under them Dashtek’s pace grew slower, but the princess’ increased. The snowy blanket covered the sharp rocks that had worn her pads raw and the cold kept them numb enough she could continue to move forward at a reasonable pace. Instead of finding a place to stop, Dashtek decided to take advantage of the situation and push forward. Tired as they were this was the fastest they had moved. He became overly optimistic and convinced himself that the pace was now so good it might get them to crest the mountains that very night. Besides, he thought, the flakes that were wet today and aiding their travel could easily freeze at night turning into a slick crust that would be just as damaging to their pace tomorrow. It was terribly dark by the time reality set in and Dashtek realized that cresting the trail was certainly out of reach. The snow hadn’t ceased at all, and as he’d feared, it was getting considerably colder. His body had to work harder to keep up with the princess on the snow and now the sweat from his increased exertion began to cool more quickly. The princess had noticed him shivering over an hour before they stopped and had spent the time on the journey thinking of her own ideas to keep her companion warm enough to survive the night. All of her plans involved a fire that she was helpless to build. Dashtek fought his shivering while he gathered wood. Once again he was keeping busy while he figured the answer to another problem, where to get kindling? All of the smaller branches and leaves he would have used were now wet and covered with snow. As it got darker and colder the effort he exerted to get wood wasn’t enough to keep him warm. By the time he had a reasonable sized stack of wood gathered the situation became more desperate. He had stopped shivering. The princess thought this meant that he was better, but that couldn’t have been further from the truth and Dashtek knew it. In desperation he pulled open the princess’ bag and grabbed the Hallbrook. He made his numb hands grip and made ready to rip out a few pages for kindling when he was stopped by the lioness’ firm roar. He looked into her eyes stunned and at the same time mechanically put the book back into her bag. Within seconds he had succumbed to the cold and fell motionless onto the snow. Hypothermia had set in. What had she done? She didn’t realize that when he had stopped shivering he had gotten worse. She reached at him with her paw and pushed him as if to wake him up. When he didn’t open his eyes she realized how desperate the situation had become. If she could have ripped up the book and lit the fire she would have, but a lion’s paws aren’t designed for tearing pages or using a flint. There was no one to call for help, no one to save Dashtek but her. As the reality of the situation bore down on her a rush of adrenaline flowed through her body and exploded as a tremendous roar. She was hoping that the noise would have woken him up so he could use the book. When the sound failed to wake him she ran the snow limiting her eyesight to only a few feet in front of her. She scrambled up the nearest canyon wall looking for some shelter. Her pace, fueled by the rush of adrenaline, was faster than when she had chased down the deer. Still no speed could invent something that simply wasn’t there and after a few moments she abandoned her search for shelter on that side and ran across the canyon floor to the opposite wall. There she didn’t find a cave, which would have been ideal, but there was an outcropping large enough that the floor underneath was bare despite all of the snow outside. She ran back down to where Dashtek was lying. He was now nearly covered in snow. She grabbed him by the back of his coat, the bag still slung over his shoulder, and carried him as a mother carries a cub up the mountain. As careful as she tried to be, it was pretty evident that Dashtek was not cub-sized. The journey up the slope ripped his cloak, scraped his legs, and sucked the energy from her quickly. She did not even care that some of their jerky had fallen out to be buried by the snow. By the time she got him on bare ground she was exhausted—tired enough that she didn’t think to mind the cold of his nearly frozen body pressed against her fur. She was too tired to evaluate whether her plan to keep him warm would work; too tired to do anything but close her eyes and hope that her body heat was enough to keep him alive. The lionesses’ keen ears and the princess’ unfamiliarity with sleeping outdoors had her awake before dawn as the forest creatures of the night rustled through the leaves on their way back home. As she became more aware of her surroundings she noticed she was still next to Dashtek. She felt a bit embarrassed by her kindness toward him. She thought about what he would say when he woke up and she was generally uncertain of how to manage his reaction to her being so close. To avoid that whole awkward scene she decided to move to the other side of the fire pit to where she had been deep in thought the night before. Her spot from last night that had been so comfortable she had uttered her first purr was now cold from the night, and wet from the morning dew that had been settling. It was like trying to go swimming in early summer when the water is still cold. She would have moved back to the dry spot near Dashtek, but now he was stirring, a sure sign that he was beginning to wake up. She didn’t want to appear as though she’d begun to care for him. Not that it was a secret she wanted to keep, but just because it was something new and she didn’t know how to handle herself. Despite the wetness, she laid down to make it appear as though she had been there the whole night, and Dashtek, believing the princess to be happily asleep, quietly began to get ready for the day ahead. She carried on the charade of faking sleep for some time and would sneak a peak now and again deciding whether or not enough of the chores were done to justify her being awake. By the time the princess did decide to get up Dashtek had caught so many fish that both of them had a scrumptious breakfast. It did not take long to eat it, or clean up afterwards. With their meal finished, they went on their way. It took two days of travel to reach the foothills, and at the entrance to the canyon path to the North Country. The terrain up to this point offered enough food and shelter to make traveling doable but not terribly comfortable. In the canyon it would be much different. The rocky floor would replace the leaves and grass of the fields and woods they had been traveling through. At the mouth of the canyon lay the town of Makuan. This would be their last opportunity to buy the supplies that would allow them to survive the inhospitable road ahead. Jan positioned herself out of sight in a wood while Dashtek went into town. Being a squire it was his responsibility to carry his knight’s money. With Sir James’ passing the contents of the purse were now his to spend. Though it did not have much, he figured it would have enough. Their plan was for him to go shopping, come back to where Jan was hiding, rest until dark and begin their journey under the cover of night to avoid detection. This way they could make it into the canyon at night without anyone noticing the lioness. The shopping part of their plan went off without a hitch, Dashtek even got a good deal on a new cloak. But when he went to back to meet up with the princess, she was gone. Did someone find her? He hadn’t noticed any human tracks coming into this part of the wood, but then again he hadn’t really been looking for them either. He retraced his steps for about fifty meters looking at the ground to see if anyone else’s footprints had been there. The dry weather of the past few days made it difficult for him to recognize even his own steps. Had someone else walked that way it would have been even harder for him to tell the difference between his tracks and someone else’s because back then people’s shoes had roughly the same soles. He walked back under the canopy of trees to see if he could find where she went. In the woods it was even more difficult. The leaves that lined the floor made it difficult to track which direction the lioness went. Dashtek stood still in the last spot he had seen her and listened for any sound. That is to say, his body waited and was still, but his mind was far from idle. He wished he could see the tracks better, but he had little gift for tracking. Tracking. Hunters were good at tracking. Hunting. Kilewal. If only Kilewal was there to help him. The great hunter could practically see an hour old animal track as though the creature was in front of him making it. But Kilewal wasn’t there to help. But maybe another hunter in the area could see things tracks as good Kilewal and had killed the princess. He senses became even more alert at the thought that she had been hunted. Just then a noise erupted nearby and Dashtek scrambled to get to the source of it as quickly as possible. Maybe he could still save her. When he arrived he saw the final moments of a great hunt, but it wasn’t the lioness that was being hunted. Dashtek beheld not only a terrific chase between the lioness and a small deer, but the lioness first hunt. The swipe of her large paw tripped its feet. It wasn’t clean, but it was enough to throw the animal off balance giving her the chance to pin and strike. In a moment her claws were extended and with another slash she had ripped its throat. Dashtek cautiously approached the scene. The lioness looked remarkably like a house cat proud of its work on a mouse. As he drew closer he could see the deer was still breathing heavily, pinned, and panicked. Dashtek used his knife to finish the kill and began gutting and preparing it. His compliments for her efforts took the form of talking about how much the meat would help them. When she wasn’t pacing back and forth to watch Dashtek work, she was laying down cleaning her paws with her long tongue, and her tail flicking happily from side to side. It was still fairly early in the afternoon. Dashtek used his newly purchased flint and steel to get a fire going. The princess waited until the meal was cooked before eating confirming that she still preferred a cooked meal to a raw one. Once a leg was ready she fully enjoyed the full fruits of her work. There was more than enough food for them that evening, so Dashtek took the remaining meat, cut it into strips, and began to dry it over the fire to make a type of what today we’d call venison jerky. It was a very practical choice because dried meat doesn’t sour as quickly as raw meat. Between the venison and the supplies he purchased, Dashtek was pretty confident they would make it through the Zahre mountains before running out of food. That night he went to sleep smiling and warm under his new cloak. According to their plan the pair left after the last lights in town were out for the night. The night was still and none of the townspeople saw them enter the canyon path near the river through the mountains. Instead of traveling their full planned distance, the two opted to stop where the terrain offered a good place to rest. They hadn’t calculated being so tired from traveling at night, though they did cover the distance rather quickly as the princess discovered her four legged agility over the rocky terrain. They rested starting early in the afternoon taking a pleasant nap with the afternoon sun warming their bodies. Now was not the time for a conversation, but Poplazi who missed the important parts of the stories he told, also missed what was important about the moments in life as well. So he thought the argument was perfectly appropriate. “Well, no. But that doesn’t…” Before he could continue Kilewal interjected. Dashtek grabbed the princess’ bag from her tent and asked the hunter which direction the tracks of the wizard lead. Kilewal pointed to the east. The two began to run. Kilewal tried to yell just before they were out of earshot, “You will not find a wizard on that path.” He could not risk being any louder as the hunting party was closing in and might have also heard. Dashtek and Jan were only just out of sight just as the hunting party and the nephews arrived. The oldest nephew called out to the huntsman. “Kilewal! Did you see the lion? The only lion in the land! What a trophy that would be, eh? Will you help us find it?” Hearing the name of Kilewal the crowd became more excited. Kilewal had no small reputation among the all the kingdoms. The crowd behind him cheered the idea of having a great hunter assist them. When the cheers of excitement subsided, Kilewal shrugged his shoulders and grunted. Confused at the grunt the hunting party turned to Poplazi for an explanation. Poplazih suddenly became quite excited to have a willing audience. In his usual fashion he relayed the facts focusing though on the most insignificant things of the narration and confusing his audience in the process. He never bothered to tell the party where the lioness had gone. Instead, he focused on how just moments ago he was rudely interrupted while trying to have a reasonable conversation. He continued his rant and relayed the inconvenience of being impolitely awakened from a nice dream, and carried off to go trap a rabbit instead of having his normal sleep. Oh and he was sure to mention that he did not have a proper breakfast. After all, it is the most important meal of the day. He became so impassioned about these inconveniences that his accent became more pronounced and his words harder to understand. When he got to the part of meeting the lioness and Dashtek, burying the knight, and the hunting party coming, he was speaking entirely in his native tongue. The members of the hunting party, seeing him so animated, did not want to interrupt to let him know he wasn’t speaking English. Instead they chose to nod at the appropriate times making Poplazi think that the whole time he was being understood. When he finished the tale of their adventures that morning Poplazi continued to ramble away entirely in any number of languages other than English and mistakenly thinking that he had found a group of men who actually understood and care for his ramblings. And so he recounted all of the adventures and inconveniences he suffered on his travels. His stories were told with such irrelevant eloquence (although in another language) that the hunting party understood none of the details. Even if they did understand all of the things he was saying it only would have led them to conclude that none of it was actually important. The conversation may have continued for much longer had it not been for a dark cloud that began to rain as it passed over the group. A hunting party is something like a parade, and a little rain can go a long way to spoil both. By this time the princess and Dashtek had made their way toward the church where the two old friends were inside getting married. They chose a path through a field of nearly ripe wheat tall enough to mask a lioness moving among the stalks, and made good progress until they came to a road that lead directly into town. The width and straightness of the road made it easy to see for miles in the distance along its course. Dashtek told the princess to wait concealed in the stalks, then he walked to the middle and looked both ways. At first the scene appeared to be fairly safe. There was no one who appeared to be traveling towards them from either direction. The only threat to their being spotted was a small number of people at the bazaar near the church busily exchanging goods. Dashtek stood there another minute to ensure no one was watching then signaled for the princess to cross while he watched toward the town. She bolted across the road and it’s rather a shame no one was watching. A lioness in motion at top speed is a rather beautiful thing to behold. Especially when she’s not hunting you. Once he heard her soft pads pass behind him he waited to a count of twenty looking to see if anyone was moving in the town. Then he went and joined her in the field on the other side. “I couldn’t tell if someone had seen you, your highness. I think it’s wise if we wait here a minute to see if they sound an alarm.” A couple of minutes had passed and Dashtek again returned to the road to have one last look to see if anyone was coming. At his final step to the middle of the road he heard a peal from a large bell in town. Thinking it was the town alarm he ran back to the side of the princess and the two of them sprinted for a nearby wood and kept running for some time. The truth of it was the bell wasn’t the grab your torch and pitchfork sound of an alarm to gather the townspeople. It was the sound to announce the come and throw rice at the new bride and groom for the marriage of Alamus and Arable. Oftentimes the things that we run from in life are based more on fear than fact. It was late afternoon when the two finally stopped at a cool spot surrounded by oaks and hemlocks with a stream running through it. They hadn’t run at a dead sprint the whole way. There were times when they merely walked, but on the whole they had been moving at a good pace for the better part of the day and were tired. In a few hours the sun would be setting, but neither companion felt the need or desire to go any farther. Jan was tired from her first day walking around on all fours. Having gotten used to fancy carriages and strong horses carrying her everywhere to a full day of running was exhausting even if she did have four feet to spread the work around. After taking a good drink she laid down on some leaves underneath one of the trees, put her head on her paws and slept. Dashtek knew better than to lay his head down right away. He was still uncertain that they hadn’t been followed. The rain earlier in the day concealed their earlier tracks closer to the campsite well, but the afternoon air had been dry and the wet soil from the morning rain only made their afternoon tracks more obvious for anyone looking. He was ready to move at a moment’s notice, but if they had to move again, they’d be moving all night on an empty stomach and that would be a recipe for trouble. Any two people who are tired, hungry, and moving across unfamiliar country are generally prone to make poor choices. This should be obvious for anyone who’s taken a family car trip. How often do family members act tired and hungry? It’s probably not relevant to describe all the trouble of such car trips, but it is ironic to note that in the car, the engine is doing all of the work. Here it was Dashtek and Jan who had to do the work and that makes the situation all the more stressful. Dashtek had a particularly good way of dealing with the problems he faced in life. He’d do his best to understand the situation and decide what needed to be done to resolve it. He had a very practical way of organizing the work required to fix things. He’d start by working on the part of the solution he could control, and thinking about the problems he couldn’t while he did what he could. In this situation he knew he couldn’t control whether or not they’d be found, but he could control whether or not they’d be hungry. He looked in the princess’ bag for anything practical to eat or use to get food. Inside the bag the things he found were entirely unsuited for the task of survival. He found a leather-bound copy of the Hallbrook, some hairpins, a backup pair of Lady Arable’s reading glasses, the plain dress the princess had complained about having to wear rolled up at the bottom, and a mirror. Not exactly the sort of things you’d want to be able to survive with. Bending down to get a drink Dashtek noticed some unusually large fish, marooned in one of the deeper pools of the stream. The fish were likely trapped there when the water receded from the last flood of spring. The fish were a good sign for two reasons. Not only did it mean he could have something for dinner, provided he could start a fire, but if more people had known about the pool they would have fished them out long before Dashtek and Jan got there. This put his mind at ease about being spotted and he was able to think more clearly. Dashtek knew the fish were nearly useless without a fire and since he needed time to figure out how to get the fish, he decided to work on the fire. He didn’t have all of that problem figured out either as he knew he didn’t have any flint or steel to use to light it. Regardless of how to light the fire he knew he’d need something to burn and so he began gathering sticks off the forest floor. After moving a couple of armfuls with the sunlight beaming through the leaves above he realized that he could use the reading glasses as a magnifying glass to start the fire. While picking up rocks for the fire pit he found some grubs that would make good bait for the fish. If only he had a hook. As he placed the rocks around the fire pit he realized he could use a couple of the smoother ones to bend a hairpin into a hook and pull a string from his coat for a line. By the time the princess woke up everything was coming along nicely. A good cooking fire was going, and Dashtek had already caught a few fish and laid them on sticks angled at the fire to cook them. The princess, who hadn’t seen the mental or physical labor it took to prepare the evening meal devoured the cooked fish and was impatiently looking at Dashtek to provide the next one. He caught and prepared four more fish each ending up in the belly of the lioness. By the time she was full, the fish had generally stopped biting while his stomach remained empty. He didn’t wait to hear a thank you, and she didn’t offer one. She laid herself near the fire and let its warmth lick her skin. The warm and pleasant dance of the flames had entranced a tired Dashtek. He was pleasantly drifting towards those moments between sleep and awake. The only thing keeping him awake was the emptiness of his stomach and as they watched the mesmerizing red and yellow sparks and flares challenge the blackness that was closing in around them he even started to forget his hunger. Then they heard a noise that got both of their attention. It was subtle but unexpected enough that Dashtek placed all of his senses on high-alert trying to determine the source. As the noise continued Dashtek could tell it was coming from the lioness. He looked over at her and smiled. Still uncertain of what was going on she responded to his look with her own expression of bewilderment. It was the look someone gets as if they had uncontrollably belched during the middle of a prayer. If a lioness could blush Jan certainly would have been. Embarrassed she tried to control it, but after a few attempts she realized this was futile and continued to purr away next to the fire. Dashtek left his line tied to a branch and moved closer to address the princess. Dashtek had no idea that the hunting party had been bored to death and then rained on. Nor did he realize that the bell in town announced a wedding. He still estimated that their current situation was that they were being hunted and in response he tried to think like a fox. In reply the princess could only offer a thoughtful look and a nod confirming that she understood. Dashtek continued. She nodded again and then put her head on her paws deep in thought. Though she was new to being a lion, she had been a lion long enough to believe that the change was somewhat permanent and couldn’t help but be a little sad. Gratitude is an expression of appreciation for something before it is taken away. The princess may have never expressed gratitude for the life she had, but she still felt a loss at its ending. She sat there remembering the dinners and parties and the hours of lessons with Lady Arable. The memories traveled at different speeds across her mind. Some came very quickly, while others floated before her like a cloud. Leaving the princess in thought Dashtek began prepping for bedtime. He went to retrieve the fishing line he’d tied to the tree only to discover a small fish caught on the hook. He gutted it with his knife and placed it on a stick as he did the others, letting it cook while he gathered another pile of braches for the fire. He knew the nights of late summer would bring with them a bit of a chill and he didn’t have a blanket. Stoking the fire would at least give him some warmth to sleep by for a little while. The fish was cooked by the time he sat down again. With something in his stomach Dashtek began to get sleepy. He laid down so he could look at the princess. It was his way of thinking that he was guarding her. She responded only with the same distant look of someone deep in thought. He let out a few deep breaths, and went to sleep. Taking the time to reflect on one’s life is a very good habit to have. It generally leads to finding opportunities to doing better and being a better person. Since Princess Jan had usually focused her energy and efforts on the next thing she wanted instead of who she was, she rarely spent any time thinking about her past. In fact, she was only now discovering some of her choices while her mind wandered through its fields of memories. She saw the faces of her mother and father, her siblings, teachers, noble visitors who warranted great feasts, and she noticed how often her memories included a loyal squire named Dashtek. She glanced over and saw him asleep next to the fire. His face was relaxed and peaceful. Even asleep it conveyed a sense of confidence. It was an expression worth pondering, and for some time she stood watching. There was something about it she liked, but could not understand why. In another moment his expression changed. She could see the muscles in his face tense as the chill of the night began to settle. She lowered herself down next to him and went to sleep. And so Dashtek passed that night with one side of himself being warmed by the fire and the other side being warmed by a lioness.